Microsoft certainly has been making patching Windows 10 PC’s difficult these days but after some significant effort, I have found a simple combination of commands and one free tool does the trick. Then download and unzip the free SHUTDOWNWITHUPDATES directly from the developer, Dennis Babkin, HERE. Sooooo, below and HERE are the easy script to do this. Alternately, if you have PDQ Deploy, you can download our PDQ DEPLOY script directly from us HERE. 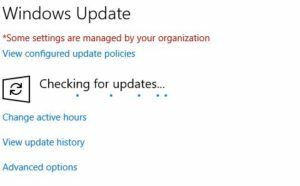 If do you use this simple PDQ Deploy script you will need to download the SHUTDOWNWITHUPDATES exe and set the path to it in this PDQ Deploy script. For more information on USOClient read our USOCLIENT DOCUMENTATION page. Tried to reproduce some commands from your script. This runs the two Win32 API functions: ntdll.dll::RtlAdjustPrivilege for priv 19 (SE_SHUTDOWN_NAME) to enable the Shutdown privilege for this process, and advapi32.dll::InitiateShutdown to restart with code 0x44 (install updates and restart) and reason 0x80020011 (Planned, application, hotfix).